When you run a small business, any hiring decision you make will not only impact on the service you provide to your customers – but it will also have an impact upon the chemistry and cohesion within your team. As your business grows, or if an employee leaves, then you are faced with the need to find someone suitable. But don’t just think about the skills and experience someone requires to perform the job – also consider the qualities and “style” of a person. Chances are they’ll be spending more time working with their team-mates than they will with any single customer. You are well aware that your employees represent you and your business. If you’ve ever recruited a lemon you will have learned the hard way that a bad hiring decision can lose you customers and seriously damage your brand. Furthermore, a poor hiring decision will usually create strain and conflict in your existing work-group, if your new appointee does not fit properly into the chemistry of the team. In a small team, if there are any personality clashes these will have a bigger impact on team morale and productivity than is the case within a larger group. People that don’t get along in a larger work-group in medium to larger size business can often find ways to minimise contact with each other. So how can you avoid these difficulties and increase your chances of making the right call, when it comes to hiring new staff? Here’s five hiring tips to help small business owners make the right decision …..
Over the years I have observed too many small business owners make the mistake of selecting someone who was not really suitable – but they were simply the best person who was available at the time. Also if you find that you need to advertise the job – try and make the role sound appealing. And try and highlight the enticing aspects of your small business workplace and working environment that would make it a good place for a person to work. If you want to attract good quality candidates, then you may need to do some “selling”. Just have a look at the job ads placed by some employment agencies and see how they go about creating interest. You may need to be prepared to advertise a salary range for the position – with starting salary dependent upon experience level of the person to whom you offer the position. 3. Plan and prepare the interview. Try to avoid simply engaging the person in an unstructured conversation that lacks direction. Instead, in order to help assess their suitability, prepare some questions that connect to each of the requirements of the role. If handling customer complaints is one of the position requirements, then you might plan to ask “Tell me about a time when you handled a customer complaint, how did you deal with the situation?” …….. You want to gain an insight into whether this person is someone who keeps their cool, is able to listen even when faced with someone who is upset – and whether they are able to engage a customer in finding a solution that can appease them. If initiative is a quality that is essential in the role, then you might plan to ask “Give me an example of where you have shown initiative in your previous work?” For work ethic, you might plan to ask “Tell me about a time recently when you went over and above the call of duty to get the job done”. If you don’t plan the interview, it can too easily get side-tracked and you fail to collect the factual information you need for making a sound decision. In addition to your planned questions, you might want to ask some questions from their resume. Remember not to be fooled by a glossy looking resume. Chances are that at least some candidates will have had their resume prepared by professionals – who may have put a bit of “spin” on their past work experience. 4. Your instincts can guide, but not be sole umpire. At the end of the day in a small business, it’s important that you like the person you will be hiring. You’ve got to feel confident that you will be able to get along with them. And your instincts and “gut feel” can be a pretty good guide for this. There are few better ways of gaining an accurate assessment of a person’s capability to perform the role than a trial period of working in the position. Even before you employ them on three months “probation” you might simply employ them on a casual basis for a week or two. 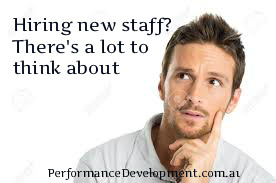 Although much of this time will be spent on training, at least you get an insight into how they will fit in with the rest of your staff, and whether they have the basic levels of reliability, punctuality, interpersonal skills and technical skills that will be required…… But if they’re not working out, then let them go quickly! Of course, remember that people will usually be on their best behaviour during this trial period – so you must still ensure that you conduct proper referee checks to confirm longer term patterns to their work history. In closing, hiring new staff is probably not something that you will be doing on a frequent basis in small business (unless you are on a strong growth path). However when you are faced with the need to recruit another employee, ensure that you invest the time and thought necessary to make a sound hiring decision. ………. Oh, and by the way – a good employee is always worth paying a bit extra for when it comes to wage negotiation. Don’t fall in the trap of being “penny wise but pound foolish”. A good employee will save you time and money in reduced supervision time, through the initiative they will apply. So it’s worth investing a little more upfront, if you find a really good candidate.